I am so happy to see you all here. I have had such a wonderful time but as the saying goes all good things must come to an end. Thank you for coming and supporting our event. As all of us have enjoyed a great time, there have been recent events which cause me to pause and think about how I live my life. 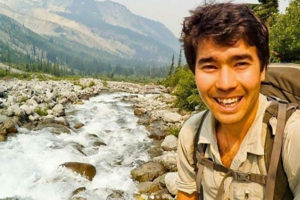 In recent days, an American missionary, John Allen Chau, was reported to be killed by tribesmen on North Sentinel Island which is part of India, 820 miles east of Chennai. It is a remote place where Christianity has not taken root. John’s goal was to live among the locals, share Jesus and translate the Bible into their language – a skill he developed through his training with Wycliffe Bible Translators. Sadly, this secluded people group has been known to be hostile towards outsiders, missionaries or not. John consistently wrote in his journal. His last entry was November 16, a day before he was killed by tribesmen using bows and arrows. That same day he narrowly escaped death, having been saved by his Bible, which shielded him when it was struck by an arrow. John knew he might lose his life trying to reach the Sentinelese, but he was unfazed. He attempted to engage the people on November 17th, only to be felled by the tribesmen’s arrows. For those of us who possess a personal relationship with Jesus Christ, we understand the meaning of such terms as conversion, conviction and the call of God upon our lives. Sometimes family members and close friends don’t fully comprehend or pledge support when they see those who rise to the call. Yet, God provides the encouragement and direction to those who obey, and blesses those who support. We went to Japan for the same reason John Allen Chau went to North Sentinel – the conviction that God’s call was stronger than the disadvantages, discomfort and difficulties we would encounter. The world might call us fools, but the Bible tells me there is eternal reward for a fool for Christ, and deep regret for those who choose to disobey Him. I suspect there a few of you who would be willing to be a fool for Christ. Like John, you’ve already experienced being sent somewhere to minister. Even tonight, you may feel God is calling you to leave everything and follow Him wherever He may lead. Tonight, He may be calling some of you to give like you’ve never given before. May your ears and hearts be fully open to His promptings, whatever they might be for you. And may the indescribable peace God gives when we say “Yes” to Him carry you above any concerns that may try to rob its landing in your soul. A month and a half ago, GLINTS was contacted by Dr. David Boan who is the WEA director of humanitarian advocacy and service. 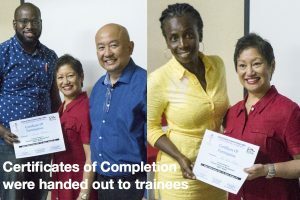 Having known of the Velascos’ experience after disasters struck Japan (2011) and the Philippines (2013), David wanted them to prayerfully consider training Christian leaders in the Caribbean in disaster response. So, when David called, Levi and Diane said yes, as God had already been giving them a burden to participate in Christian disaster response after Hurricanes Irma and Maria. 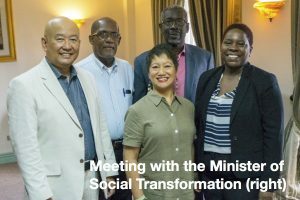 The receiving partners in Antigua were the Evangelical Association of the Caribbean (EAC) and the Antigua-Barbuda Evangelical Alliance (ABEA). GLINTS’s purpose in Antigua was to come alongside Christian leaders eager to make an impact in the lives of survivors. Antigua absorbed about 1,600 Barbudans after Hurricane Irma hit, the entire population of the island! It is the first time in 300 years that Barbuda has zero long term inhabitants. So, there is much hardship and hopelessness among the survivors. 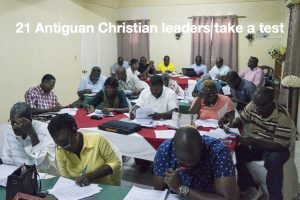 The exciting news is that there were 21 Antiguan Christian leaders who participated in the disaster response training. This first generation of trainees will have the knowledge base to provide assistance when the next disaster hits, mobilizing their respective churches for this effort. 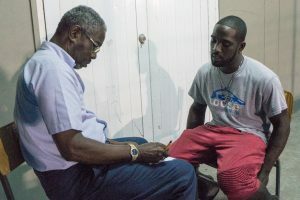 As part of the training, attendees had the opportunity to connect with survivors housed in two shelters by interviewing individuals regarding their experience before, during and after the hurricanes. What our next steps look like. We are burdened for the children who have not had the opportunity to process their trauma stemming from the disaster. Please pray with us as we explore the possibility of conducting OperationSAFE (OpSAFE) programs in Antigua. OperationSAFE, a GLINTS global partner, is a ministry organization dedicated to administer psycho-social first aid to children affected by disasters and war. 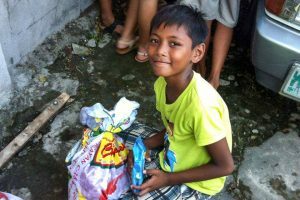 OperationSAFE 5-day camps have been most recently conducted in Mindanao, Philippines and Nepal with much success. Prayers for survivors, the Church in Antigua and GLINTS’s next steps are highly coveted, especially for Christians would continue to invest financially in the lives of people in the Caribbean as their disaster woes are now bypassed by the media. From the Concert Hall to a Disaster Zone. Yes, literally. What a stark contrast as I (Levi) played viola at DuPage Symphony’s first concert of its 2017-2018 season (October 14th), leaving the next day aboard a 5:30am flight to Antigua, West Indies via Miami, Florida. Diane and I, however, had to stay overnight in Miami since our flight from Chicago was delayed an hour. With a tight connection time, our flight to Antigua left without us on board. We consider this delay a God-send as we were able to rest after two weeks of intense preparation for not only our assignment in the trip, but also leaving GLINTS work behind while being gone. We recharged our energies for the grind of days ahead. Background. As hurricanes Irma, Maria and Jose were pummeling different areas, Diane, my wife, and I started praying as to how we could be involved in disaster response. The call of God was to the Caribbean, specifically in Antigua where we ministered October 15-21. 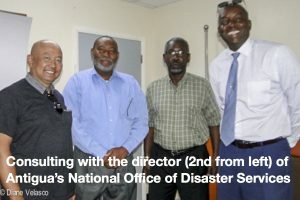 While there, we met with government officials and received an overview of their response on Barbuda, visited a shelter and talked to survivors, conducted a two-day training seminar on disaster response and consulted with leaders of the Antigua Barbuda Evangelical Association (ABEA). I’ve outlined specific prayer request below so you can pray alongside our brothers and sisters who are in great need. The article below was written on Saturday, October 21, 2017 at 12:00pm. 1) Pray for all those who completed the training, that they will bring what they’ve learned to their individual churches. 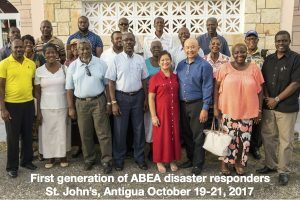 2) Pray for the leaders of ABEA, that God will give them wisdom as they plan to be involved in disaster recovery now by providing emotional care to 300 #Barbudans (who are in two separate shelters) and forming teams to help in the clean up efforts in Barbuda. 3) Pray for the 1,600 (not 16,000 as the media had quoted) Barbudans who were evacuated to #Antigua, especially those who live in shelters. 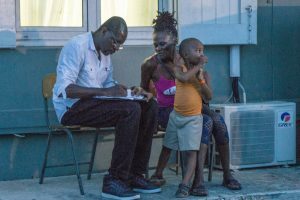 Pray that they will remain hopeful and that they will be able to return to Barbuda before Christmas. 4) Pray most especially for the children who are segregated from their parents most of the time in the shelters. Pray for protection of marriage bonds even though males and females have separate quarters in the shelters. 5) Pray that emotional health professionals will give of their time to be available to provide free #counseling to the Barbudans. 6) Pray for the Church in Antigua, that they will be united in being the hands and feet of Jesus in these difficult times. Pray also that believers in Antigua will cast aside cultural barriers and show the love of Jesus to the Barbudans. 7) Pray that the world will not forget that there is still much suffering in the #Caribbean, specifically that funds would be raised to help in the #rebuilding_of_Barbuda. Have you ever wondered if there were any benefits associated with giving? According to the Apostle Paul, the Philippian church expressed their concern for him and the work he was doing by providing for his material needs. It seems the followers of Jesus in Philippi didn’t even have to be coaxed to give. They gave from the very start, supporting Paul as he ministered in Macedonia and Thessalonica. They saw the need and willingly and generously supplied support over and over again, no matter their own financial limitations. Paul commends the Philippian believers, expressing his gratitude by listing the benefits of their generosity: 1) their generosity was being credited to their spiritual account; 2) their gifts were pleasing to God; and 3) the Lord was going to meet all their needs. (Philippians 4:10-20). While raising missionary support in the mid – 1990s, Diane and I tried to get an appointment to speak at a small church in southern Washington. Sherry, our contact, was very apologetic about the state of their church – it was struggling and there were fewer than 50 people attending, and they could not offer us any support. We persevered in trying to get that appointment and after a number of tries, Sherry finally agreed. 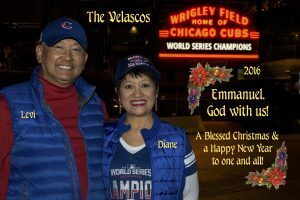 We traveled to the church (all six of us Velascos) without any expectations of being supported, as our only desire was simply to bless the congregation. So the few days we spent with these believers, our family ministered in song, the Word and in presenting our future ministry as church planters to Manila. As we neared our departure for the mission field, Sherry called us and said I think we can do $25 a month. We thanked them. But wait, there’s more! She called two more times and by the time we left for the Philippines, the church had pledged to support us at $125 per month! Like the Philippian church, the “Little Church That Could” in Southern Washington was blessed beyond measure because they gave beyond their capacity to give, resulting in God’s manifold blessings for the church and community wherein their congregants live and serve. May each one of us experience the benefits of giving as we follow the Lord in obedience to His promptings! In 1999 I had the privilege to serve at Promise Keepers based out of Denver, Colorado where I was introduced to the song, Knowing You, by Graham Kendrick. Singing it again at church recently, I quickly realized that this song embodies who I was, who I am and who I will be. Here’s a powerful rendition of Knowing You sung by Bishop Joseph Garlington at a Promise Keepers event. May this song touch your life deeply as it did mine. Today this Scripture has been fulfilled, Jesus taught as he quoted from Isaiah 61 in the synagogue in Nazareth (Luke 4:17-21). And so have hundreds of prophecies regarding our Lord from the Tanakh (Old Testament). And so we live in the present day in an ever-increasing cynical, angry world, raising its collective fist to the One who sovereignly came to set at liberty those who are oppressed, first among the Jews and ultimately the whole world! This Gospel is what we proclaim at GLINTS through our global staff and ministry partners. May the God of Christmas fill your hearts with gratitude and continued generosity. We are humbled by your continued support. 2016 is coming to a close. And we rejoice for the great things God has done through GLINTS. Together with joy is our hope that we close this year without a deficit in our account. We are depending on God and His people as conduits of financial blessing. Please prayerfully consider a sizeable one-time gift towards our ministry. As a token of our gratitude for any amount donated, we will send you a mounted canvass picture from one of our ministry trips. Online donation is easy. Click here to access our online donation system. What are you thankful for? Is it your job, family, friends, things you’ve accumulated or your status in life? Are you also grateful for tragedies in your life like sickness, financial meltdown, divorce, fractured relationships or a wayward child? God is the basis of my thanksgiving. I am grateful for Him who created me, saved me through His Son and gave me meaning and purpose in life to do His will. Because I have totally placed my life into God’s hands and He is able to sustain it no matter what, I have the capacity to give thanks in the good times and the bad. I am confident that in all seasons of life, God continues to work His plan. So whether I am up or down, successful or failing, strong or weak, loved or unloved – in all things I will give thanks . . . to God. On Sunday, November 20th, as we were getting ready for worship service, I heard a song on WMBI (Chicago) entitled The Basics of Life sung by 4Him. Memories of family concerts in the Pacific Northwest came cascading back like a flood. I thought, as I reminisced, it was apropos 25 years ago, but moreso today. Read the lyrics while listening to the song. As newly-landed immigrants in the US we settled in the land of Lincoln in 1984. Being a new Chicagoan I immediately was drawn to rooting for the Cubs, Bulls and Bears (no offense Sox fans). I remained loyal to these teams even though we had moved away from the area and lived in other cities that had their share of professional sports teams. Our return to Chicago in 2003 rekindled my passion in cheering for these, my sports teams. Redemption. There were several times when the Cubs were on the verge of losing Game 7 of the World Series. The team was dogged by defensive miscues, most egregious were two by Javier Baez (one of the youngest) and two by Dave Ross (“Grandpa Ross” to his teammates). Feeling they both let their team down, both Baez and Ross redeemed themselves and each hit the ball out of the park soon after their errors. Brotherhood. They were their brothers’ keeper. It was evident all throughout the season that the Cubs team cared for each other. There were no prima donna tantrums or evidences of the blame game. This was true in Game 7 of the World Series as well – team members encouraged each other when the going got tough. “We picked each other up,” Javier Baez shared. Perseverance. Down 3-1 in the World Series, this Cubs team never gave up. Winning three straight games, with two in enemy territory, was a tall order for this very young team. But each rose to the occasion, buckled down, and the Cubbies were able to grind-out back-to-back-to-back wins. Long-Suffering. The fans, that is. I’ve seen Cubs games on TV and at Wrigley Field (especially in the 80s) when the Cubs weren’t that good. These Chicago Cubs fans never booed them. It’s as if to say, we enjoy watching you play more than “the W” (the win). And so it went for 108 long years, suffering but never wavering in their loyalty to the Cubs. Trusting God’s Timing. Many fans and Cubs players themselves were unsure of the outcome of the game. There were several times when the Cubs felt assured they’d end their 108-year championship drought, only to be discouraged as the Cleveland Indians fought their way back to contend for the win. Then the rain came, and a 15-minute delay ensued. What now? Jason Heyward, right outfielder, gathered the team and gave an inspirational talk ending it with: “I don’t know how it’s going to happen, how we’re going to do it, but let’s go out and try to get a W.” And win they did! Heyward said that “it was the best rain delay of all time.” The rain ended the drought . . . as it should. The answer? It was in the rain. I’m sure you can come up with a few more of these parallels, but what is certain is that real life is rife with the manifestations of theology and the stories of characters from the Bible. On October 20, 2016, Typhoon Lawin (Haima) hit the Philippines and made landfall on the northeastern province of Cagayan with sustained winds of 140 mph (225 kph). It was the strongest typhoon to visit the country since Haiyan (Yolanda) in 2013. Hardest hit provinces include Cagayan, Isabela, Apayao, Abra and Ilocos Norte (northwest). 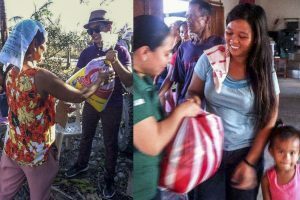 PhilRADS, a GLINTS global partner, is in the thick of providing disaster relief in the areas struck by this latest typhoon. 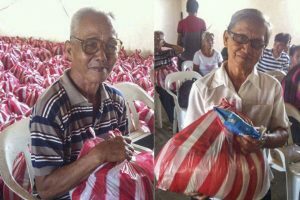 Staff and volunteers are presently distributing relief supplies of nutritious food to 1,000 families in the provinces of Cagayan and Ilocos Norte. 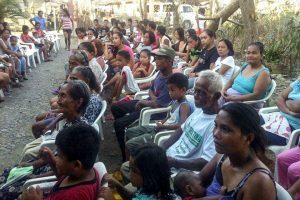 Your financial gifts will help PhilRADS to help many more families who have been displaced by this super-typhoon. Click here to donate.